I am excited to announce my first solo exhibition in Oregon! at the 510Museum + ArtSpace in Lake Oswego. The exhibit continues through November 17. “Water & Form” is inspired by intimate study of our local coasts and wetlands. 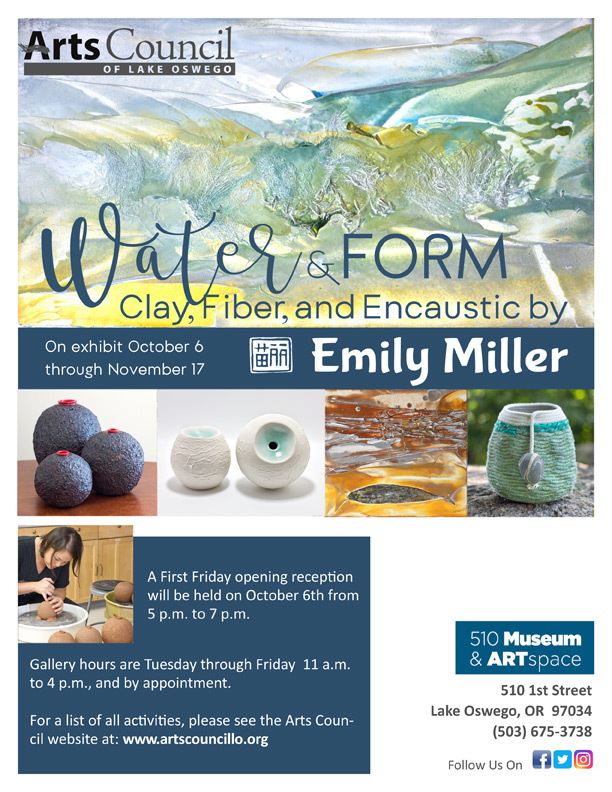 Works in clay, fiber, and encaustic explore the way water shapes our landscapes, and the gathering of life that shares them. I’ll be showing brand-new works in all three mediums, plus the Cascadia Winter encaustic series and my latest collections of pods. The Wanderers will also find a new home in “Water & Form,” which will be very different from previous displays. Click here for more details, photos, and a catalog of works included. The catalog will be updated with 16 new works in encaustic and fiber art on October 4. This is the first time I have exhibited my painting and sculpture together as a cohesive show. I’ve been working double-time on this exhibit over the past few weeks, and I can’t wait to share how it all comes together. Please join me at the opening reception if you can!